and second thing was it contained a suspicious link which I didn’t click in the email as I had a clue that such emails are usually spam or phishing attacks. Instead what I did was I opened other browser in which I was not logged in to check what the link is about. Once I opened the link, it forwarded me to this page which looks precisely a copy of the Twitter login page, but look closely, its neither a HTTPS secure login nor it is a twitter.com homepage. 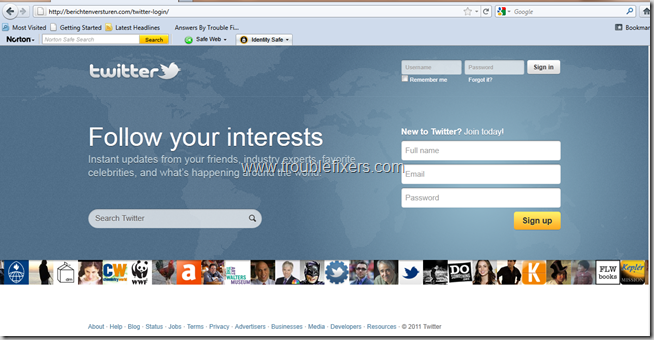 This is a phishing page, where many people will mistakenly try to login with their twitter id and password after which this information will pass on to hackers and the account gets compromised. After this, the hackers can misuse this twitter account to send more such provoking direct messages to more people and it starts to spread ! 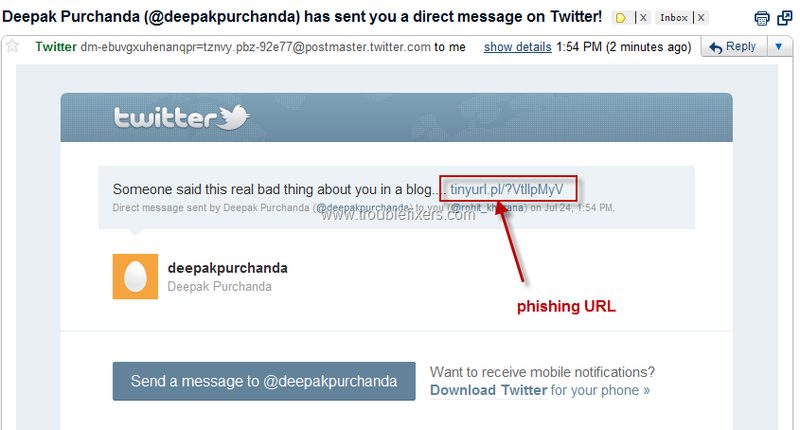 If you get such message via email or Direct message on Twitter, do not click the link in this DM. Manually type twitter.com in the address bar of a browser and login to your twitter. 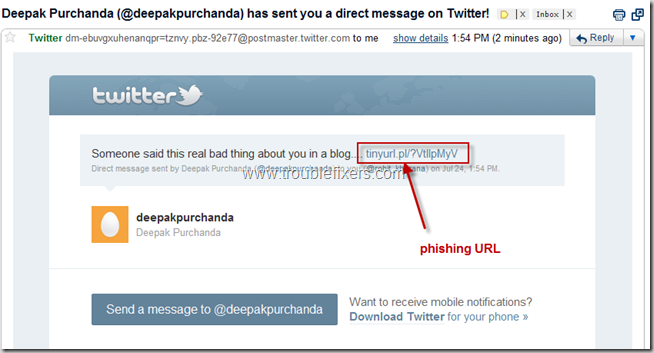 Click on messages, select the phishing message and click delete link at the bottom of the message. Do share this information with your twitter follower and friends on Facebook so that they don’t fall in such trap. Prevention is better than cure, so next time you get any provoking message, don’t get angry and look at it closely before clicking on it and falling into a trap. Why Is My Windows Firewall Not Working? [Security] Exynos Powered Android Phones Prone To Security Vulnerability– How To Be Safe?